BBQ Pulled Chicken is tender, flavorful, healthy, and ridiculously easy to throw together. It takes two simple steps, five minutes to prepare, and, effortlessly, dinner or party food is ready to go in the slow cooker or Instant Pot. Summer entertaining is officially here. Now’s the time friends and neighbors crawl out of their holes (especially here in the Midwest) to socialize at BBQs, graduation parties, and family reunions. But summer also means a lot of impromptu entertaining. After spending all day at the beach or pool, it’s nice to keep the festivities going with family and friends. The problem is everyone is hungry, but no one has the energy to cook. Throwing hamburgers or hot dogs on the grill doesn’t always have to be the standard go-to. 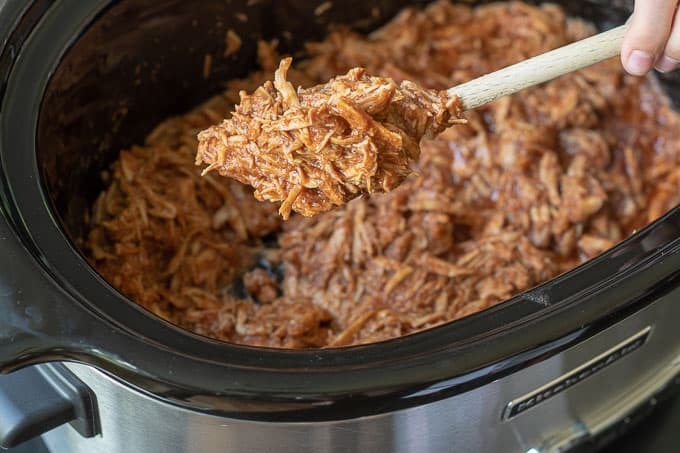 Best BBQ Pulled Chicken is handedly more flavorful, healthier, and just as simple to throw together. Mix spices together and rub on chicken breasts. Place chicken breasts in slow cooker with a little apple cider vinegar and water. Shred tender chicken with two forks and stir in your favorite BBQ sauce. Add liquids and cook on HIGH PRESSURE for 7 minutes (10 minutes if chicken is frozen). Ladle out 1/2 cup of liquid to discard. Use two forks to shred chicken on a cutting board or, a faster option, use a hand mixer right in the Instant Pot. Stir in BBQ sauce. What to Serve With BBQ Pulled Chicken? The object of stress free entertaining is to keep it simple and delicious, right? Here are some equally effortless and delicious side dishes to go with BBQ Pulled Chicken. 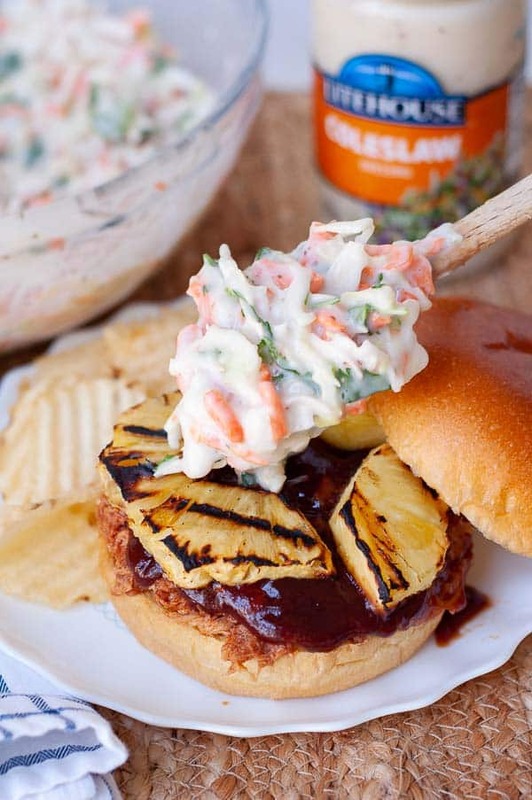 For these BBQ Pulled Chicken sandwiches we topped them with fresh, grilled (or, alternatively, broil) pineapple and an easy, cool Cilantro Jalapeño Coleslaw on top. Serving coleslaw on pulled meat sandwiches is pretty much an essential for me. I love the taste of thick, creamy coleslaw dressing, the crunch of fresh ‘slaw, paired with the tender, smokey BBQ meat. 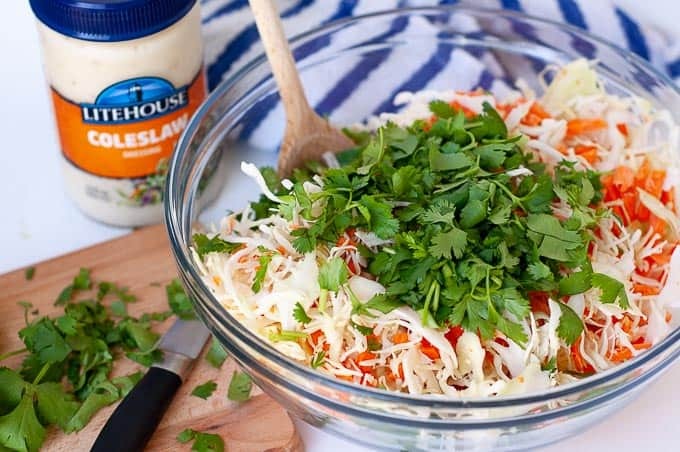 Using Litehouse Coleslaw dressing is an essential time saver and the perfect blend of sweet and tangy. Just mix a jar of Litehouse dressing with a bag of ‘slaw mix, and you have a cold, crisp side dish ready to go in minutes. For these BBQ Pulled Chicken sandwiches I added chopped fresh cilantro and some minced jalapeño to compliment the BBQ chicken and pineapple. How Much BBQ Pulled Chicken Per Person? This recipe makes about 3 cups total of pulled chicken. For regular size buns, estimate about 1/2 cup per sandwich. If you’d rather serve smaller Hawaiian-style buns, estimate 1/4 cup per sandwich. 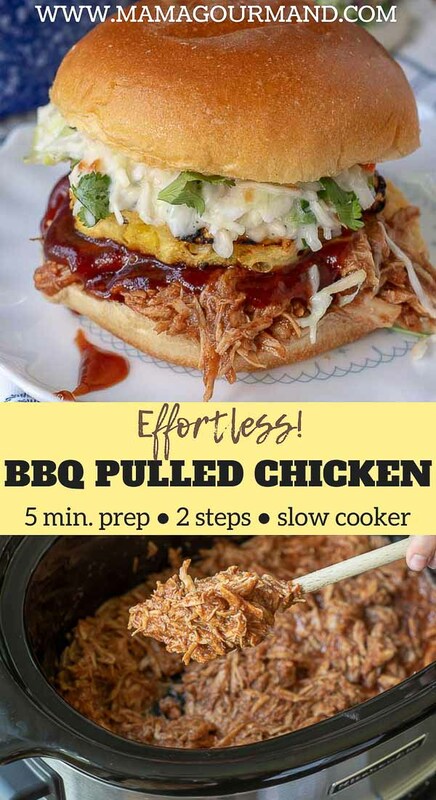 BBQ Pulled Chicken recipe can easily be doubled. Can I Freeze Pulled Chicken? Yes! When you make this recipe you can always make double and freeze half. Or, if you have a party to prepare for in the future, make BBQ Pulled Chicken, cool, and freeze in gallon ziplock bags. When you’re ready to use it, thaw overnight in refrigerator and gently reheat on stove, in microwave, or throw back into your crockpot. 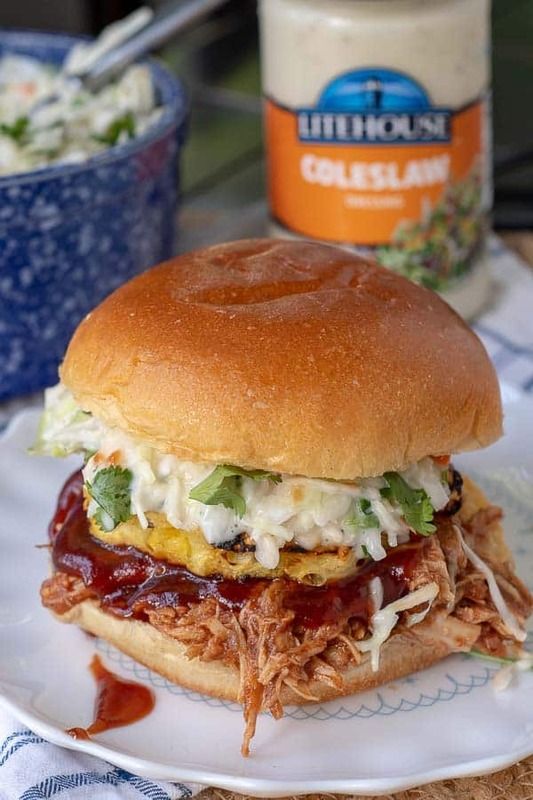 SAVE THIS BBQ PULLED CHICKEN TO YOUR PINTEREST BOARD! BBQ Pulled Chicken is tender, flavorful, healthy, and ridiculously easy to throw together. It takes two simple steps and five minutes to prepare, and you'll have dinner or party food ready to go in your slow cooker or instant pot. In a small bowl mix together paprika, brown sugar, cumin, garlic powder, onion powder, cayenne pepper, and kosher salt. Rub seasoning mix all over chicken breasts, on each side. In crock pot pour apple cider vinegar and water. Place chicken on top and cook on high for 3 hours or low 5 hours. When chicken is tender, use two forks to shred in slow cooker. Pour in BBQ sauce and stir to combine. 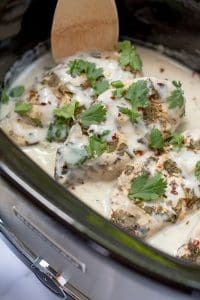 Place chicken breasts in Instant Pot. In a small bowl mix together paprika, brown sugar, cumin, garlic powder, onion powder, cayenne pepper, and kosher salt. Sprinkle tops with half of seasoning. Flip breasts over and sprinkle with remaining seasoning. Add water, vinegar, and 3/4 cup chicken broth. Cook on HIGH PRESSURE for 7 minutes (10 minutes if chicken is frozen). Natural release for 5 minutes, then quick release remaining pressure. Remove lid and ladle out 1/2 cup of liquid to discard. Use two forks to shred chicken on a cutting board or, a faster option, use a hand mixer right in the Instant Pot. Stir in BBQ sauce. For pineapple slices, grill about 4 minutes per side, or until pineapple starts to char. You can also place pineapple on a cookie sheet and broil 4 minutes per side. Meanwhile, place slaw mix, cilantro, and jalapeño in large bowl. Pour in Litehouse Coleslaw dressing and stir to combine. 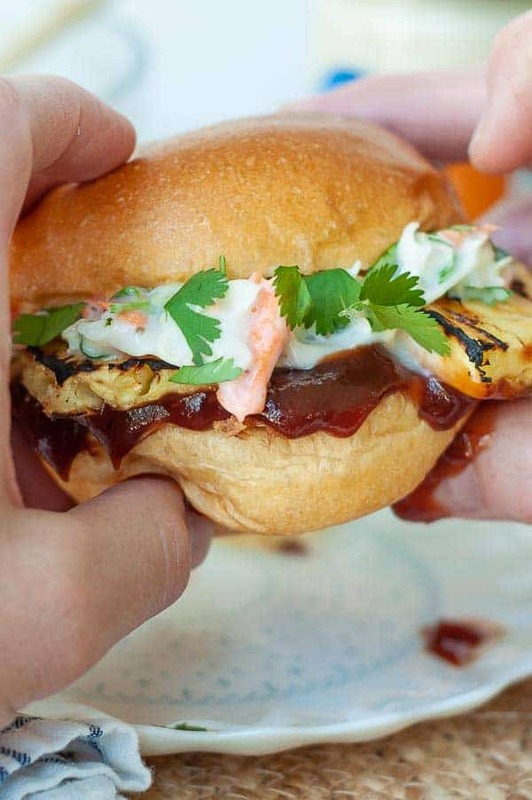 Serve sandwiches on buns with pineapple, Cilantro Jalapeno Coleslaw, and additional BBQ sauce. Nutrition facts are for 1/2 cup serving of BBQ pulled chicken without coleslaw, pineapple, or bun. 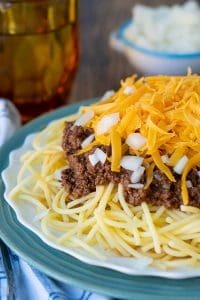 *1 tablespoon of minced jalapeño brings a very subtle, mild heat that doesn't overpower. If you like more spice, double the amount of jalapeño. 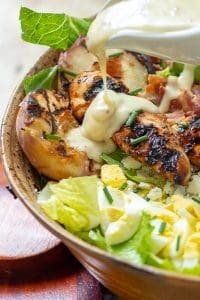 TIP: The flavors meld and get better the longer the BBQ chicken sits. For best flavor, make a day ahead and rewarm before serving. TIP: This recipe can easily be double or tripled if feeding a crowd. Just make sure your crock pot is large enough to hold the chicken breasts or divide recipe between two crockpots. I just have to say that my wife made this recipe and it is amazing. We ate it 2 nights in a row. Sadly my daughter likes it better than the BBQ chicken i spend 12 hours smoking.